Okay. So this ice cream is to die for! Sounds weird right? Goat cheese? Cherries? It's amazing. 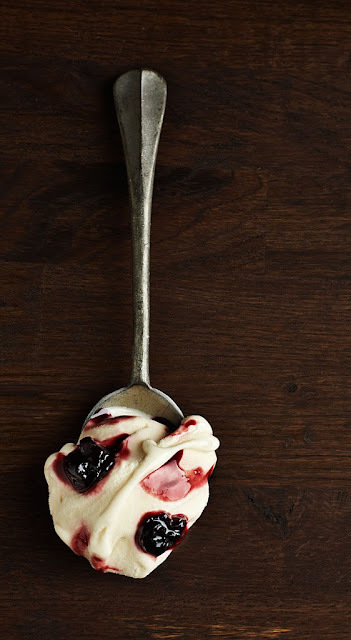 I was visiting my friend, Crystal from Wabi Sabi, the other day and she had just finished shooting photos of her ice cream concoctions, one of which was this amazing creamy-cheesy-cherry bliss. Isn't her photo stunning? You can find her simple version of the recipe here. Don't forget to check out her other yummy creations complete with mouth-watering photos. Nom. I gotta figure out how to make that ice cream via her recipe. That sounds to DIE for. For realz! That looks great! The photo is wonderful too! oooh that looks really yummy.